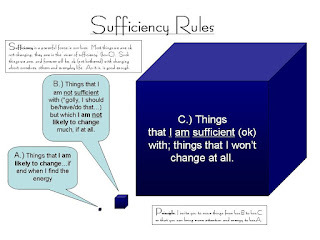 Begin this post by clicking on and reading the "Sufficiency Rules" graphic to the left. Low Glory: Throughout my life I have been defensive. One reason is that I have been 'encumbered by many things'...things in box-B (see graphic) that I have rightly sensed my society values, applauds and normatively accepts. To shift my energy (to make the merchant's trade) I have been working on some powerful, logic defenses (see the last paragraph in my book, 'The Hunt Is On!). These stories have helped me greatly in pushing things in box-B over to box-C.
Because people fear the unfamiliar, the edge can be a fearful place. The way of the [Virgin] Master is so edgy that many people are apprehensive even talking about it, let alone traveling it. Many people prefer to pursue accomplishments along more familiar, traditional, conventional and supposedly more sure pathways. High Glory: What I have written here is a prelude to more glory that I will reveal in coming stories wherein I will find more glory in (my and other's) personal growth. I shall soon reveal that what I above refer to as energy shifts, has to do with discernment of spirits, has to do with the work I am called to: spirit possession work (see The Hunt Is On!, pg. 27); the spirit of the Warrior; the Spirit of God -the Great 'Energy' Shifter.